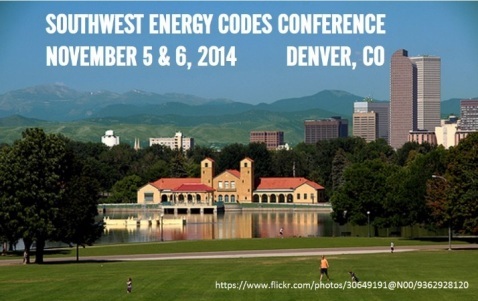 The first Southwest Energy Codes Conference was recently held for one and a half invigorating days in Denver, Colorado on November 5th and 6th. Hosted by the Southwest Energy Efficiency Project (SWEEP), this was the first regional energy codes conference held in the SWEEP states. The goal of this event was to bring representatives from each state together to discuss wide-ranging topics related to energy codes. Presenters came from national organizations, regional utilities, HERS providers, energy code consultants, ICC and building officials. Presentations included information on the newly inked 2015 IECC, ASHRAE 90.1-2013, and the ENERGY STAR New Homes program. The presentations also covered building envelope and diagnostic testing, case studies, getting to net zero energy, utility energy code programs, commercial construction activity in the Southwest, and the business case for deep energy retrofits. Additional information and links to presentations can be found here. In the Midwest, the Midwest Energy Efficiency Alliance (MEEA) held their 5th Midwest Building Energy Codes & Benchmarking Conference in Kansas City, Missouri from November 18th to 20th, bringing stakeholders from across the region to discuss how best to promote the adoption and raise compliance with building energy codes in the region. The first day focused on the building energy benchmarking for existing buildings and covered topics from the disclosure initiatives in the Midwest to energy tracking tools to access and acquisition of building energy data. The second day, which focused on energy codes, also brought together diverse topics from different regions, including the builder perspective on codes and the new compliance path in 2015 Residential IECC. Additional conference recap can be found here.